Temple of Ranma's Sailor Senshi Seifuku • View topic - Collar/neck guard name? 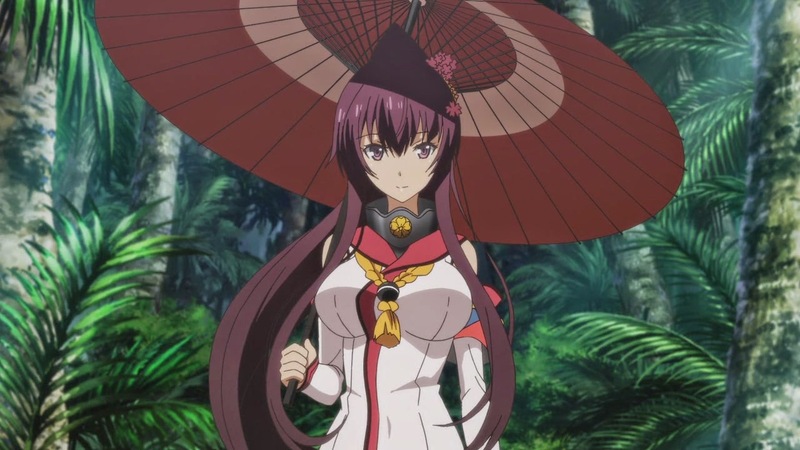 Would anyone know what the actual name of the metal guard/collar around this character's neck might be? The closest I've come so far is the gorget or nodowa... but, while ornamental (her collar is also technically supposed to refer to a ship's bow), I believe the gorget and nodowa are more for protecting/covering the front of the neck, as opposed to encircling the entire neck (as above). Still alive, but failing miserably at dodging Real Life. Gorget should be fine. It refers to various kinds of coverage. When included with a full set of plate armor, for instance, it wasn't uncommon for it to act as a support for other plates in the area, so it covered plenty more than the neck. A guruwa is like a nodowa except it goes around the whole neck instead of being tied at the back. Bevor seems to be the European version of the nodowa. Except sometimes it seems to go all around as well. Hmm... Oh, that depends on what helmet it was meant to be paired with apparently. But there seems to be a variation on the aventail that is similar, its other distinct feature is that it has protection hanging down from the neckpart(not visible on the pic). 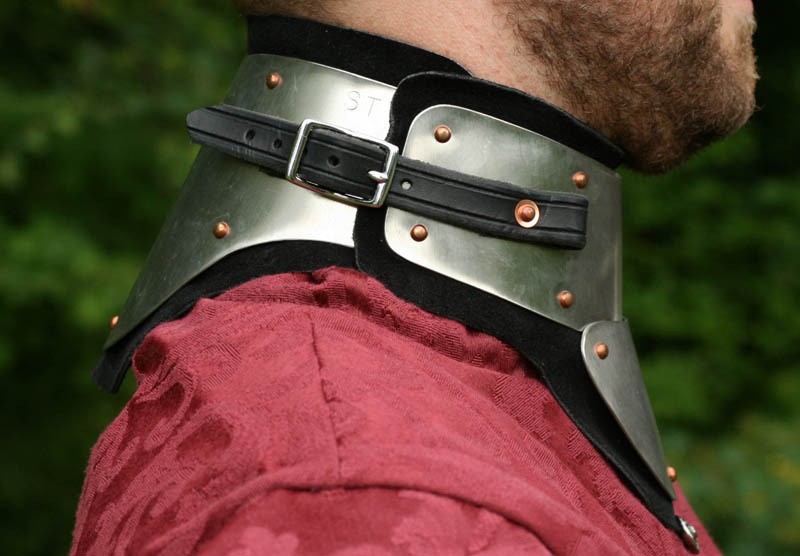 Gorget appears to be same as above mentioned variant of aventail, except using stiff "plate"(metal or leather) as the protection going down from the neck, rather than the chainmail of the aventail. Actually, based on pictures i can find, the things that actually look closest to your pic is some variants of chokers. Is it meant to be armour, then go for gorget or guruwa, if not, choker. Chokers are meant to be fitted tight against the neck (hence the name), as far as I know. Crescent Pulsar S wrote: Gorget should be fine. It refers to various kinds of coverage. When included with a full set of plate armor, for instance, it wasn't uncommon for it to act as a support for other plates in the area, so it covered plenty more than the neck. Yeah, that might be the simplest way to do it maybe. It IS close enough. Mmm, but with nothing being a perfect word for it, well, a "loose fitting, tall choker" should at least describe it well enough that you understand the explanation. There ARE gorgets that are only front/side covering. Also, part of why i suggested choker is due to how most normal models of all of those variants is because of how much they continue down/outwards from at the low end of the neck. So, since it´s not "armour", and i presume it does not extend outwards/downwards much, a collar or choker might be the best name for it. Next best is probably guruwa, then gorget. I think... Definitely not clearcut. Spica75 wrote: There ARE gorgets that are only front/side covering. Also, part of why i suggested choker is due to how most normal models of all of those variants is because of how much they continue down/outwards from at the low end of the neck. It extends at least into her breastline (like the actual bow/prow/stern of a ship), although depending upon the continuity/artist, how far down it descends is up for debate, I guess. She's also wearing a (separate) bra formed primarily from shell casings, but that's a different issue. Probably a very different issue yes. Well then you´re basically just going to have to decide on your own, as then there is no obvious name at all ( at least not that i could find ). And if the material hanging down is in any way "soft" or loose, then you might have to add the aventail to the mix as well. No chance of finding what the original author/writers called it? Still, at least that might reduce the suitability of choker. I think guruwa, gorget or collar will all work decently enough to be descriptive if you add a few words for it, descriptive words depending on what name you use for it. Well, I've realized I've been an idiot. I'm writing the majority of the scenes from her (AU) first-person point of view, and with her mindset/frame of mind in that particular scene, she doesn't really need to use the exact name. Makoto wrote: Well, I've realized I've been an idiot. Always "fun" to notice you´ve been spending lots of effort for no good reason. Ah well, if you need it later, at least you have some decent ideas for it.